The Avenger was a tough and accurate bomber that had a reputation for taking punishment and bringing it's crew home. Relatively easy to fly, the big Avenger was surprisingly nimble. The TBF could pack up to 500 lb bombs or one Mk1 13-2 torpedo, and with all three tanks topped up with 335 gallons of fuel, could strike targets up to 260 miles away. 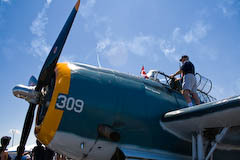 More than 7,500 TBF/TBM Avengers were produced in 20 variants, which fought with distinction in most major naval battles in the Pacific and was well liked by the Royal navy. The 'TBF" version was originally designed and produced by Grumman,: the "TBM" was produced by General Motors. Zeno visted this beautiful TBM maintained by the Rocky Mountain Wing of the Commemorative Air Force. Click here to see the photos . * And a high resolution reproduction of a 76 page F4F/FM2 Wildcat pilot's manual in.pdf file format. Contains photos, systems diagrams, performance charts, procedures & more.